Excellent list of medical apps for medical librarians. 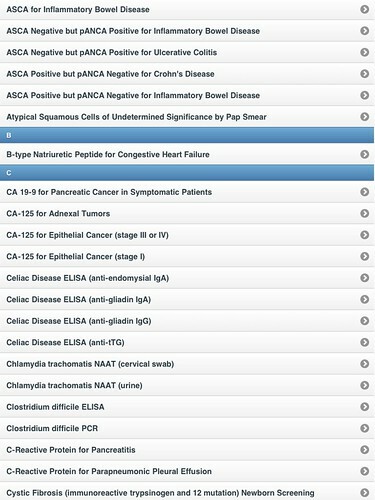 I would also add some of the other NLM apps not mentioned that are useful here: http://www.nlm.nih.gov/mobile/. I’m also a big fan of Medscape, Epocrates and Skyscape and have found that many physicians like them too. Last night, in the #MedLibs chat on Twitter, there was a conversation about benefits of librarians going on rounds with the doctors (shorter stay, reduced mortality, increased patient safety, reduced costs) (bibliography from “Librarians on the Front Lines“). A side conversation about our favorite apps took on its own life. I wanted to collect all my notes in one place for easy reference, so when I have more time I can come back to download any of the apps I don’t already have. Here we go! An excellent blog post from Sally Gore at the UMass Medical Library about the hope (and need) for librarians to branch out into new areas. I really appreciate her points about expanding CE classes and melding our skills with those of biomedical science programs. Her ideas about thinking outside the box to reach new areas and expanding our knowledge-base are much appreciated. I too hope that librarians become more excited about (rather than shy away from) these opportunities and push themselves to reach out into new areas, broaden their skill set, and spread the word to others in the field. Last fall, the Graduate School of Biomedical Sciences here at the University of Massachusetts Medical School hired, for the first time, an Assistant Dean for Career and Professional Development. Cynthia Fuhrmann, PhD, has been on the job since September, working hard towards her charge of establishing an overall program for career planning for the doctoral students at our university. Dr. Fuhrmann comes to us from the University of California, San Francisco, a school that has proved to be a leader in the area of academic career development.